Last week the newly appointed minister of Religious Affairs Aung Ko told the Voice of America that only Buddhists were considered “full citizens” of Burma, while Muslims and other minorities counted as “associate citizens”. Except a little whisper, unfortunately, this incendiary comment failed to create an outrage within Burma. There was no official statement from the government. No monks distanced themselves from the position taken by Mr. Ko. Further complicating the situation, a few days later the minister of Religious Affairs decided to pay homage to Ashin Wirathu, the self-proclaimed Bin Laden of Burma whose incitements to violence against Muslims have been partly responsible for the severe persecution of the Rohingya ethno-religious minority in Rakhine State, Burma. Seven Nobel laureates have declared this persecution a “textbook case of genocide” at the 2015 Oslo Conference at the Nobel Peace Institute. The time for Mr. Ko to make this public clarification of his views on Muslim citizenship is surely now. For years we were making excuses for Ms Suu Kyi, the Nobel Peace Laureate, when she remained silent on the Rohingya issue, that she is silent so that she can win the elections. Well, now she is in power but still silent. It is a golden opportunity for her to set the tone for her administration. She needs to publicly state that all Burmese citizens are full citizens, with full rights and responsibilities with no regards to religious or ethnic differences. While Buddhism as a religion espouses acceptance and compassion, radical groups like the Ma Ba Tha promote only hate and are rightfully listed as such by the US Congress. Their motivation for persecuting Rohingya – including cancelling their citizenship; prohibiting them from travelling from village to village; and expelling Doctors without Borders (Medecins sans frontieres) from the region to reduce medical care in the community – stems not from the principles of their faith but from fear, anger, and hatred. The new government, rather than stoking the flames, should do all they can to ensure their department of religious affairs brings an end to the hostilities currently being expressed. No U.S. Citizen would be happy being told their citizenship is second-class to others because of an immutable characteristic. Wait … U.S. Citizens have been told that, repeatedly, and their response has been to agitate for change until it is no longer socially or politically permissible to do so. Blacks, women, Native Americans, and Muslims after September 11th are all groups locked in this struggle in American society. Since the U.S. knows so well what it takes to restore legal rights to disenfranchised populations, it is our duty to raise awareness about what is happening in Burma and increase pressure on Burmese elected officials to make the same changes we have made over our short history as an independent nation. The role of government is to be an equal arbiter of the law, and to care equally for all its citizens, not to distinguish which religious groups deserve basic human rights and which do not. Fortunately, there are some Burmese Buddhists who stand tall in the face of extremist racism. At the 2015 Oslo Conference, Burma Task Force, the Parliament of the World’s Religions, and other organizers honored three Burmese Buddhist monks for their contributions to saving lives during anti- Muslim violence. Their names were U Withudda, U Seindita, and U Zawtikka and they risked their lives to shelter Muslims in their monasteries away from mobs who’d harm and kill them. The Muslims they save number in the hundreds. Citizen Mg Mg, who hid in U Withudda’s monastery, told Burmese news paper the Irrawaddy “We could not depend on the help of police or local administrators.” However, they could depend on these interfaith activists, who were willing to risk the violence of a mob to uphold their human rights. As a nation, we must emulate these monks’ actions, and be to the government of Burma what the monks were to the mobs. We fail to uphold our own Constitution and our own founding values if we fail to protect them. 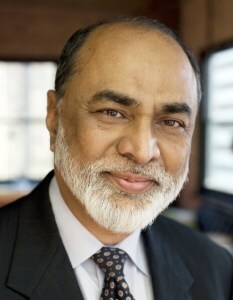 Imam Malik Mujahid is Chair of Burma Task Force USA.